In addition to slowing growth in China and economic problems in Russia and Brazil, the New Development Bank may face competition from the China-led Asian Infrastructure Investment Bank. On April 1, 2015, Russia became the chairman of the BRICS grouping – an informal association of the largest emerging markets: Brazil, Russia, India, China and South Africa. Many important decisions will be made during a summit chaired by Russia, to be held from July 8 to 10 in Ufa. However, according to Russian experts, the informal association is experiencing difficult times. The Russian and Brazilian economies have stalled, the GDP growth rate has fallen in China, and agreements between members go beyond the contour of BRICS. The acronym BRIC was first suggested by Goldman Sachs analyst Jim O'Neill in a research note in November 2001. Brazil, Russia, India and China moved towards creating an informal grouping that later added South Africa, forming the BRICS. “The basis for the association was high GDP growth rates of national economies, which averaged 6.7 percent per year,” says Valery Abramov, a professor at the Russian Presidential Academy of National Economy and Public Administration. According to Abramov, countries with vast resources and buyers' markets are forecast to largely determine the pace of the global economy. As O'Neill noted in his book, The Growth Map, the BRIC countries will overtake G7 in terms of economy by 2035. The BRICS members, however, are at different stages in terms of economic structure and the level of socio-economic development, Abramov says. According to the International Monetary Fund, GDP per capita (on a purchasing power parity basis) in Russia in 2014 was $24,800, in Brazil - $16,096, in South Africa – $13,050, in China – $12,880, and in India – $5,850. “Russia is at a higher stage of economic competitiveness, having the highest scientific and technological potential to move to the innovative type of development and to ensure technological leadership in the BRICS grouping,” Abramov says. The creation of joint financial institutions should give a new impetus to the association. The agreement on the establishment of the BRICS joint currency reserve pool was signed at the last summit in Brazil. Its stated capital amounts to $100 billion. To this end, the BRICS countries will contribute different shares: China – $41 billion, Russia – $18 billion, Brazil – $18 billion, India – $18 billion, and South Africa – $5 billion. In fact, we are talking about the creation of "mutual aid," including in the case of one of the BRICS nations having financial problems. “The framework agreement on the establishment of the pool, signed by the BRICS leaders at the July 15-16 summit in Brazil does not include direct obligations; resource commitments will be required when central banks sign a compensation agreement,” Abramov says. At the same time, he says, the central banks of the BRICS grouping conserve resources designated as their share in the pool as part of their international reserves. “The pool of nominal foreign exchange reserves is supposed to be an alternative to the existing international institutions such as the International Monetary Fund and the World Bank,” Abramov says. BRICS' second project is the New Development Bank, which will provide loans to invest in a variety of institutional or infrastructural projects in other countries. 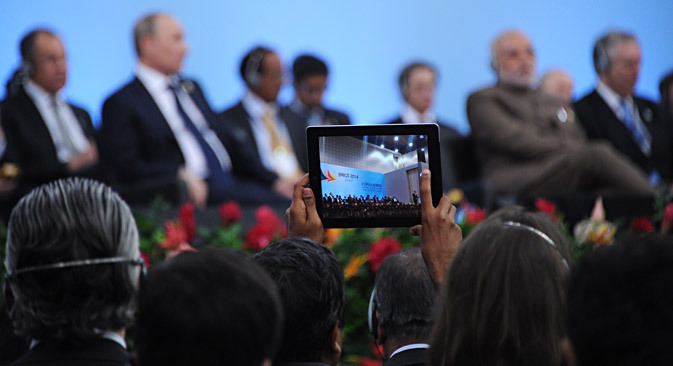 In the first phase of development, the BRICS bank's capital will amount to $100 billion. The headquarters will be in Shanghai, while the first head of the bank has been nominated by India (ICICI Bank’s former chairman, K.V. Kamath). In early May, Russian Deputy Finance Minister Sergei Storchak named Greece as one of the first potential recipients of aid from the BRICS bank, since its total debt amounts to 320 billion euros, or 177 percent of GDP. Of this sum, Greece owes about 56 billion euros to Germany alone. “Establishment of the analogue of the IMF on the basis of contributions from the BRICS countries is one of the many steps toward the gradual de-dollarization of the world economy,” says Anton Soroko, an analyst of the investment holding Finam. However, he says, the main direction of its proposed activities is the financing of long-term infrastructure projects. Experts believe the relevance of BRICS financial institutions has reduced. In particular, the organization faces competition of the Asian Infrastructure Investment Bank, initiated by China. "The AIIB is indeed performing similar functions," Soroko says. Moreover, bilateral agreements between Russia and China take place outside the framework of BRICS. For example, during the official visit of Xi Jinping in Moscow on May 8, the sides agreed on Russia's future participation in the Chinese project Silk Road Economic Belt, while Russian banks received loans from China in yuan. But UFS IC chief analyst Alexei Kozlov says, the main competitors of both the BRICS Development Bank and the AIIB are still Western investment institutions, and their goals are the same in this respect. However, economists say, the main problem is that the BRICS members do not grow at the same pace as before. According to Moody's Investors Service, the old GDP growth rate of 7 percent per year is shown only by China and India, while Brazil and Russia are experiencing stagnation and recession. As a result, in an interview with US magazine Forbes in January, O'Neill did not rule out that Russia and Brazil may leave the organization. “If you take a broader historical perspective, the Russian economy has a lot of similarities with the economies of the other BRICS countries,” says Dmitry Bedenkov, head of analytical department of IC RUSS-INVEST. According to Bedenkov, the organization can become an effective instrument of economic interregional integration. “From the countries united only by matching economic growth rates, BRICS has become a geopolitical union, a political force, which brings together about 40 percent of the world's population,” Kozlov agrees. According to him, from this perspective, the significance of the BRICS is not declining, but growing.